One of my favorite dishes growing up was Carne Beef with White Rice. This traditional Puerto Rican dish uses tomato sauce, olives, diced potatoes, canned corned beef and seasoning. The resulting zesty tomato sauce with olives is comfort food at it’s best. Since starting my healthy lifestyle, I have not made this for my family. So, I decided to take my favorite flavors from the traditional dish and use boneless chicken breast instead of the canned corned beef, skip the diced potatoes and served my dish with herbed quinoa and a green salad. The result was just what I wished for…..
Below is the recipe. Hope your Sunday dinner was as good as mine. Season chicken with salt, pepper and garlic powder. Add the olive oil to a large saucepan and warm over medium-high heat. Brown chicken in the olive oil. Remove from pan and set aside. Add sofrito to the saucepan and cook for 3-4 minutes. Add the olives, tomato sauce, sazón, oregano and water. Return the chicken to the sauce pan and add salt and pepper. Cook on low heat about 20 minutes. 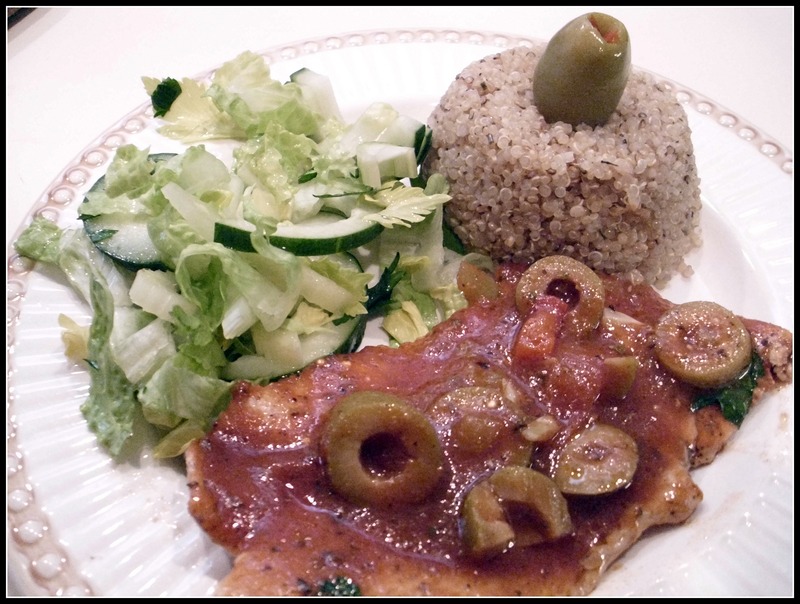 love this – i was in miami for a long time and this was one of my fave combos chicken and olives : j yum!